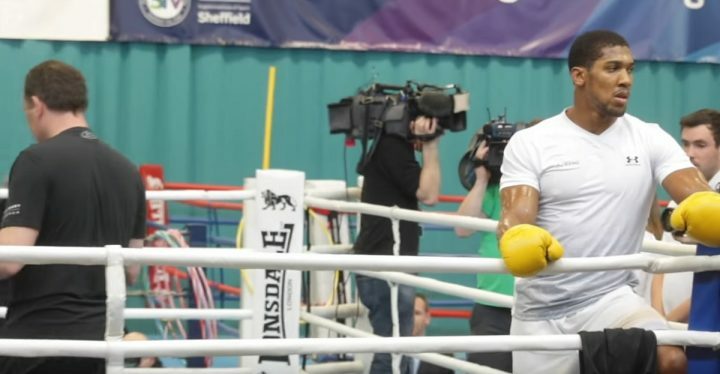 By Scott Gilfoid: IBF/WBA heavyweight champion Anthony Joshua is looking lean and very fast at a lighter weight for his unification match against WBO champion Joseph Parker in ten days from now on March 31 at the Principality Stadium in Cardiff, Wales. Joshua thinks there will be blood in the fight. It’s unknown whether he means his blood or Parker’s. Joshua suffered a bloody nose in his last fight against Carlos Takam on October 28 in Cardiff. Joshua should have lost this weight ages ago. All that muscle that Joshua packed on in the last four years was more for show than it being useful weight. This fight will be a good test to see if Joshua has the chin, power and stamina to compete against Deontay Wilder. If Joshua can blast through Parker without any problems on March 31, then you can surmise that he’ll be a good test for Wilder. However, if Joshua struggles to beat Parker or if he loses the fight, then you can forget about him being a threat to Wilder when the two of them eventually face each other. Joshua, 28, hasn’t revealed his current weight, but he looks like he could be as low as 230 pounds. Joshua (20-0, 20 KOs) started his career weighing 230 lbs. for his pro debut against Emanuele in October 2013. Joshua was a much faster fighter back then compared to how he’s looked lately in weighing over 250 lbs. for his fights with Wladimir Klitschko and Carlos Takam. Joshua isn’t overlooking the speed and power of Parker. He knows that Parker has the punching power to knock him out of there if he can land his shots. Joshua will probably be looking to show off his boxing skills in the early going to make sure he doesn’t get clipped by one of Parker’s big punches. Parker is coming in lean as well for the fight as well. Parker looks too thin though. He has the look of someone that has lost a lot of muscle. Both heavyweights have lost an absurd amount of muscle weight for this fight. Whether they’re following WBC champion Deontay Wilder’s lead in reducing their weight is unclear. `Wilder surprised a lot of boxing fans recently in weighing in at 214 lbs. for his title defense against Luis Ortiz on March 3. Wilder was outweighed by almost 30 lbs. by the Cuban fighter, and he still ended up winning the fight due to his superior stamina and punching power. Joshua’s shape looks to be the best of his career for the Parker fight, but that doesn’t mean he’s going to win the fight in a slam dunk fashion. Joshua still has a chin problem that won’t go away no matter how much weight he loses, and his stamina issues are well-known. Joshua was having stamina problems as far back as 2013 in his first fight against Leo. Joshua looked tired in stopping Leo in the 1st round, and that was with him weighing 230. Parker has the speed and combination punching to trouble Joshua if he can get him past the early rounds to tire him out. “I can’t tell you exactly how the fight will go, but we’re big, we’re strong, and the punches do hurt after a while. I definitely know there’ll be blood. There will definitely be blood,” Joshua said to Sky Sports News. Joshua has nothing to lose and everything to gain in coming into the fight with Parker as low as possible. Joshua has learned from his last two fights that he’s not going to go far weighing in the 250s. He can’t carry that weight adequately without gassing out. The extra muscle might help Joshua with a little more punching power, but it comes at the expense of his endurance and speed. If the Joshua-Parker fight were decided on which fighter put in the better pad workouts, Joshua would be the winner going away. He looks faster and more powerful on the pads than the 26-year-old Parker right now. At the same time, Joshua looked gassed out from hitting the pads, and he was lucky he could get a breather. On March 31, Parker will be looking to make sure he doesn’t give Joshua any rest breaks. He’s going to want to take the fight to him and connect with his speedy combinations. Joshua has the speed advantage, but if he gasses out, his work rate and speed will disappear. That’s why Joshua has got to push for an easy knockout, so the fight doesn’t go into the second half, which is the dangerous zone for him. He does not want to risk a long distance encounter. ”The thing is – you can definitely hear the leather, cracking on people’s heads, if you’re close enough as well, and we’re both fast. You’ll see really good combinations that you don’t really see from heavyweights,” Joshua said. The 26-year-old Parker is the toughest young heavyweight in his prime that Joshua will have faced. Joshua has a win over Wladimir Klitschko in April of last year, but the Ukrainian was 40-years-old at the time, and far from his prime. Just watching that fight, you could tell that Joshua would have been no match for Wladimir if he’d been 27 or 28. Wladimir was a much better fighter in his prime than Joshua. Of course, if you listen to Joshua’s promoter Eddie Hearn talk, you’d think he’s the best heavyweight that has ever breathed. Hearn seems to have drank the kool-aid. He’s totally sold on Joshua. Whether Hearn really believes what he says is unknown. Joshua has gained a reputation for having a ton of heart for the way that he got up off the deck in the Klitschko fight in the 6th round and came back to knock him out in the 11th. However, what’s not said about that performance is that Wladimir didn’t even try and knockout Joshua after he had him hurt. Wladimir fought like he was afraid to push the envelope to try and finish Joshua off after he’d put him in bad shape. “Weight has never been an issue,” Joshua said. “I wouldn’t make weight the main factor of what I’ve been working on in this camp. It hasn’t been like a Weight Watchers camp for three months. I’ve been working on technique and stuff like that, rather than worrying so much about my weight,” Joshua said. Joshua comes across as smug when speaking about his weight. Of course, weight has been an issue for Joshua. It’s sad that he’s not able to admit that his huge bodybuilding muscles have slowed him down, making him hittable and causing him to gas out in his fights. It’s sad to see Joshua sounding so disingenuous about his weight. He says weight has never been an issue for him, and yet he’s clearly taken off 20 lbs. of muscle for the Parker fight. I weight wasn’t an issue for Joshua, then he wouldn’t have reduced the weight the way he has. You don’t lose that much weight the way Joshua has if you haven’t been working hard at taking it off. Hearn has noticed how light Parker has gotten during training camp, and he believes he’ll come into the fight in great shape on March 31. Joshua can’t let himself get caught up in a war with parker during this fight because there will be too much of a risk that he’ll get caught by one of his big shots and knocked out.